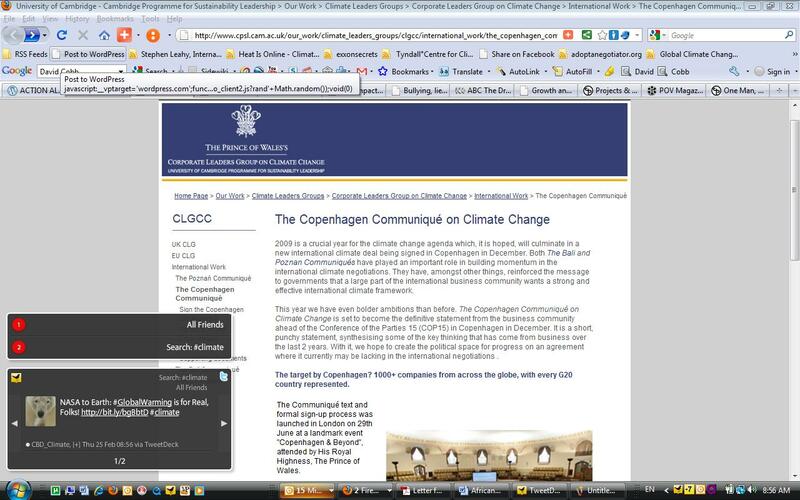 Update – Shortly after we sent this out to the GCCA list (on March 1st, 2010) – the partner link to ”The Corporate Leader Group on Climate Change’ was removed from the www.tcktcktck.org website. The screenshot, showing the partner listed in the site can be found below. This does not mean that the partnership no longer exists – simply that the partnership is no longer shown on the website. 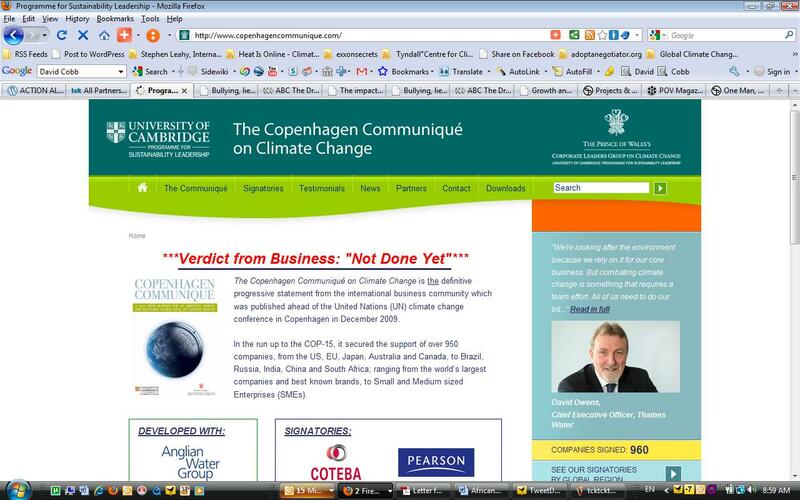 As of March 14th, 2010 – we have received no correspondence that would indicate this partnership between ‘The Corporate Leader Group on Climate Change’ and www.tcktcktck.org has been terminated. Given that you have indicated in your message received this morning that you will not be fulfilling the previous commitment to share our response with partners, as indicated in to your letter written to us on February 25th, 2010; “We will also send this note to our partners and may wish to share with them any response you send to us.”, we have undertaken to share our response with your partners. Our response will be sent in its original form (found below your response from this morning – sent to you on the 26th). and URL to be listed on our web site. Over 250 organizations have chosen to do this, and currently many more are looking to join. We are in regular contact with all of our partners, and if any of them raises concerns about our policy demands, or other aspects of our collaborative work, we will discuss this with them directly. At COP15 the tcktcktck.org campaign monopolized the NGO response to climate change, and either intentionally or unintentionally, undermined other NGOs, and the developing countries that were demanding more. Tcktcktck.org, through its listing of NGOs as partners, some of which now claim they had never agreed to be listed as partners, gave a skewed sense of support for the weak demands of the tcktcktck.org campaign. The tcktcktck.org dominance, either intentionally or unintentionally, eviscerated NGO activism and consequently influenced the weak outcome of COP15. Whether it was intentional or unintentional, the organizers of the tcktcktck.org campaign were grossly negligent. AT COP15, one of the major demands of the developing states was to call upon the developed states to both commit to strong reductions of greenhouse gas emissions, and to stabilize the rise in temperature. Many developing states called for the rise in temperature to be well below 1.5°C, and a number of developing states were calling for the temperature to not exceed 1°C from pre-industrial levels. Furthermore, most developing states called for the ppm to return to below 350ppm, and a number of developing states called for ppm to 300ppm. The tcktcktck.org campaign that dominated the discussion was completely out of sync with the strong demands of most developing states. The spokesperson for tcktcktck.org now intimates that the listed partner NGOs and the global community should have been able to understand that, even though 1990 was left out, it was meant to be included. However, the question remains, how could over 200 NGOs listed on the tcktcktck.org website have agreed to exclude the 1990 baseline, because everyone was supposed to know that it was understood [even though the US was using 2005, and Canada was using 2006 as baselines]. Or, was a baseline excluded without the knowledge and consent of the partners, and thus, were they unaware of the absence of a baseline? Even worse, were the partners aware and complicit in omitting the baseline? Were the partners involved in building a consensus of necessary targets based on the current science, or was the omission of the baseline decided on their behalf? It seems unbelievable that all NGOs partners listed on the tcktcktck.org website would have been supportive of such weak demands. Surely the leaders of a campaign which presents itself as representing hundreds of millions of people, and which thereby also sees itself as speaking for hundreds of millions of people must recognize the incredible responsibility such a statement implies. In assuming their self-appointed role, the leaders of tcktcktck.org demonstrated dereliction of duty in not advancing the targets necessary to ensure survival; the moral imperative to demand that the temperature not exceed 1°C. In your response, you did not indicate whether the NGO partners of tcktcktck.org were made aware that they would be promoting a logo which was copywritten by PR firms Havas and Euro and, if the NGOs were made aware of the implications of being associated with PR firm clients such as those in the nuclear, biotech, biofuel, oil, etc. industries. 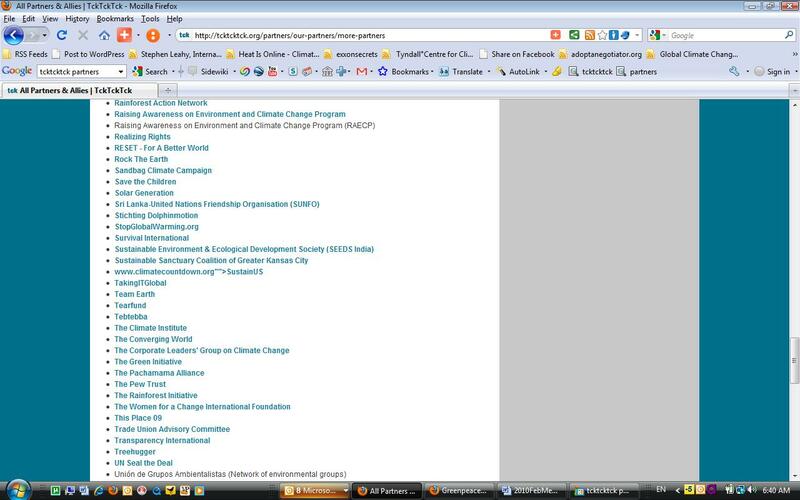 To rectify the irreversible damage caused by the undermining of the strong resolve of many NGOs and developing states to seriously maintain the rise in temperature below 1°C and the ppm to return to 300 ppm, the tcktcktck.org campaign must apologize to the partner NGOs that may not have wished to be listed as partners, or may not have wished to be associated with weak demands.